I use technology way too much. It’s imbedded in our lives in such a way that it’s just obnoxiously always there. Like that big hairy mole on your face that makes you look like Mr. Bean, and needs cosmetic surgery otherwise it’s always on your mind (“MOOOLLEEEE, MOLEY MOLEY MOLE! MOLE!”) – That’s facebook and SMS, in my mind. A big hairy mole. Last night I used my phone to text and call my boyfriend, and to alert my friend I was on the way over (rather than using a good ol’ doorbell). I used my phone to play Words with Friends, read XKCD, play Angry Birds, check my e-mail (on 3 different accounts), and check my Facebook. At work I used a computer in order to complete telephone surveys. In sum, technology is an easy way for me to goof off and not get any work done, unless it’s imbedded in my work place. It’s a big hairy mole that is more entertaining than anything else, it’s just too distracting to not enjoy. When I Google myself, and think about how future employers may perceive my life to be, I feel they would find a person with multiple personalities. I still find it baffling that there are multiple “Jennifer Staebell”s out there. I have the weirdest last name, and most people can’t even pronounce it right, yet there’s more of me out there, running around. 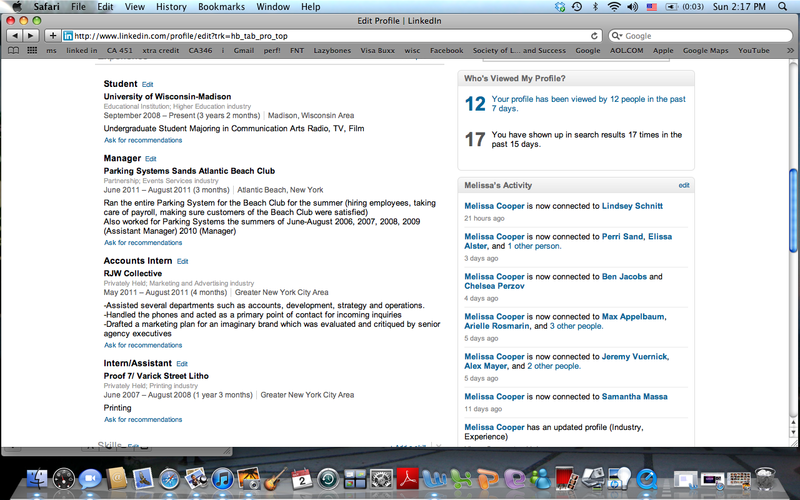 First, I found my newly created LinkedIn account. I just created it to apply for a job posting, and figure it’s a good resource to be connected to right out of college. 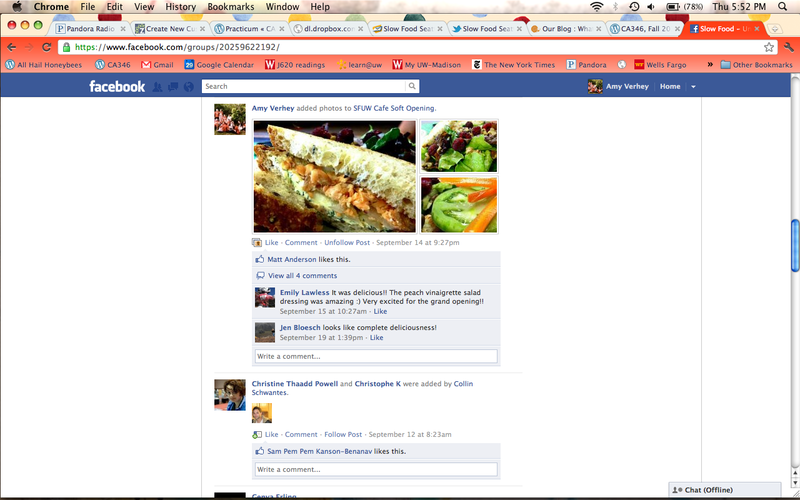 Next up, I found “Jennifer Taverna Staebell”s Facebook account pop up. Mine has serious privacy settings up, so Google never actually shows my account on search results. I like it that way, and it seems that ‘Taverna’ has decided to keep most everything private too – good, at least my future employers won’t see some crazy drug addicted hill billy Mini-Me and think it’s actually me! 🙂 Jennifer (Carson) Staebell also popped up via Facebook. This woman also has privacy settings on most of her content, but not all – such as pages she likes and her profile pictures She has good taste at least, as she is a Dexter fan. Finally REAL me showed up again with my Twitter account, followed by another link to one of my specific Tweets. I was surprised by that, I wonder what made them actually choose that specific one to single out and link to in Google. All it said was “Tweet Tweet- Twiddley Dee Deet. Rockin’ Robin”, but anyone could have read it as my Twitter account is open to all. My Etsy account also showed up, which surprised me because I don’t actively use it. I created this to start selling my home-made earrings, but realized it costs money to post up products, and decided to wait until after graduation when I get more organized with it. Other Jennifer Staebells show up. One of which is titled “Mug Shot”. Oh great. A few other seem to be business contact names – as if it was a company website. Overall, not too much damage. It’s pretty clear these other women are much older than me, so I don’t think I’d be confused with them. Religious views: Everything from Christian to Agnostic to “mind your business”. Political views: Again quite a variety here. A lot of people didn’t share this information with non-friends. But some interesting ones I found were “all are equal” and “socialist capitalist cynic”. Interests: All over the place, but often included similar organizations or “activist-minded” activities like the outdoors, Green Peace, staying healthy, and “dancing to the beat of my own drum”. From: Everywhere! Made me want to do some traveling. Here were some good ones: India, Spain, Greece, Belgium, Germany, France, Japan, Ireland. Amnesty clearly has an international reach. Rock the Vote also has a diverse group of members, but is more concentrated on what might come to mind when you visualize activists. That is, there seems to be a greater concentration of young, university students. The organization is aimed at motivating our generation to participate in politics so this makes sense. Also, given it is a national organization, the vast majority of members on the Facebook page are from the United States. Domestic Abuse Intervention Services Facebook members were largely from Madison, WI and surrounding areas. There were a few people from neighboring states, like MN and IL, often having some association with Madison, like being a UW alumni. This makes since, as it is a local organization. Another non-surprising trend given the topic of interest is the larger concentration of female members. Males still have a strong presence though. While lacking in scientific quality, my profiling of these groups members gave me a better idea of the diversity of people involved in the organzations, but also how their membership make-ups differ from each other based on their reach and message. Making Progress on LinkedIn, MySpace & Google+! Over the past week I have been using my three new social networking sites a pretty good amount. So far I have made the most progress on LinkedIn. Since my last blog post, I have made so many more connections – I am now up to 56 connections and my profile page has dramatically improved. I have all of my previous jobs listed and I have added details about each one. This week I am going to write and add a full paragraph about my occupational interests and specialties, which I have not done yet. So far my profile is “75 percent complete” because there are some sections that I did not get to yet. My goal is to have at least 20 more connections by next week, and this site is truly great for networking. It’s very interesting to read about other peoples interests and specialties and then compare that to where they have worked along with their other information. 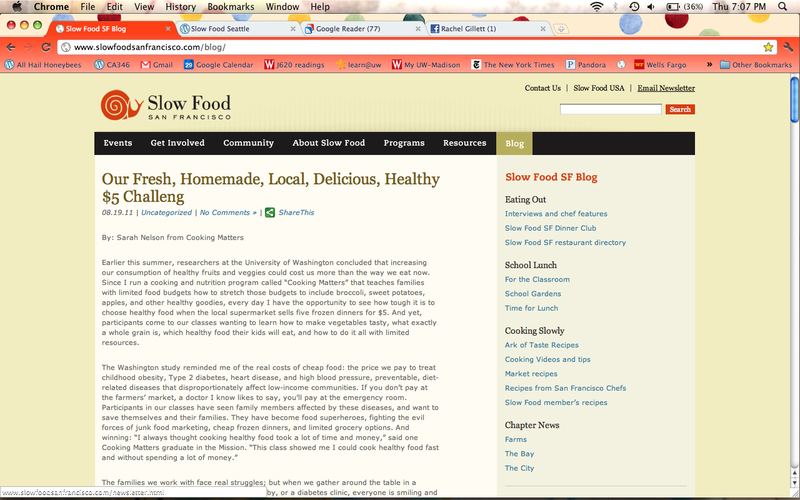 Attached are two screenshots, one of the top half of my profile page and one of the bottom half. I have been using Google+ a lot as well however the only problem that I’ve had so far is that Facebook keeps making upgrades that are copying the uniqueness of Google+. 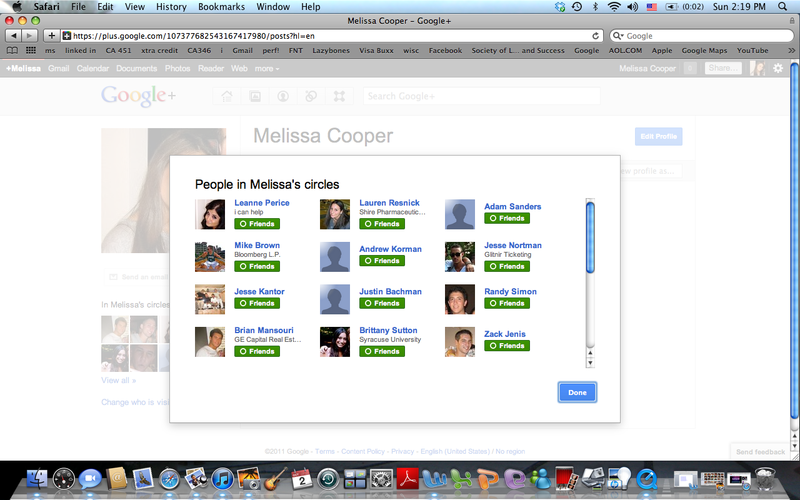 Since Google+ is connected to Gmail a lot of people are signed up for it and I have 22 people in my friends circle so far. Not that many users have made any real posts yet. One of my friends actually posted “Giving up on Google+” as his latest post. I have invited some of my family members to the site so I can put them in my “family circles” category, that way I’ll be able to see how the site works privacy wise with these new settings. There is one thing that I really like about Google+, and that would be the chat settings. There is a chat option that is easy to use and its great! Here are some photos of my profile, and of what the site looks like. 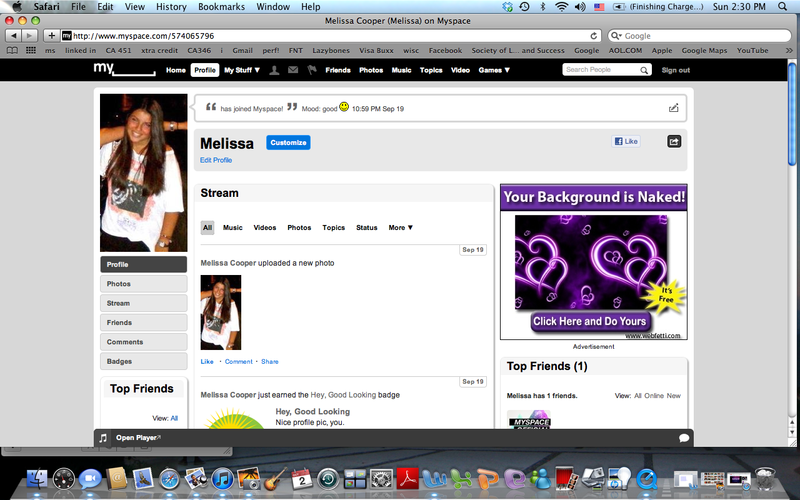 As for MySpace, I have began adding new friends to my profile. Since theres not that many people my age who are active on the site I have began to follow celebrities and music groups that I am a fan of. I am still waiting for people to accept my requests. I have made one status post so far, and I started following some popular groups that MySpace suggested. MySpace has been really great for finding new music and this is definitely the aspect of the site that I enjoy the most. This week I am going to focus on finding more friends, and hopefully people are active on the site and will accept my requests so I can see what their profiles look like. 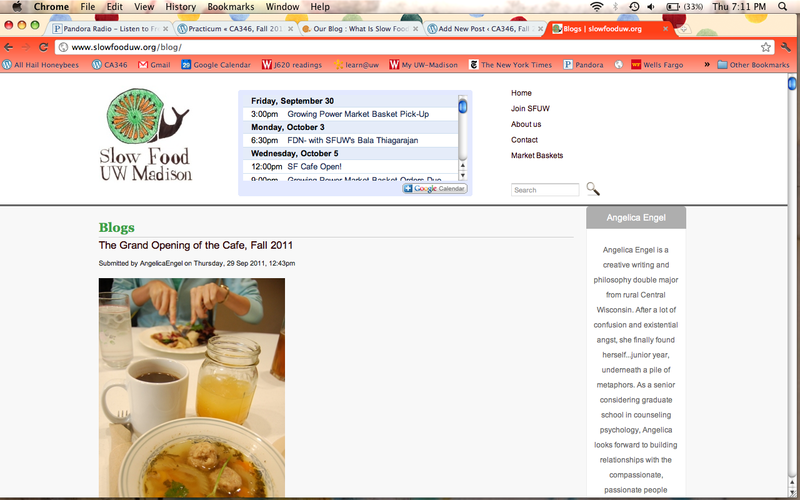 My practicum project is on social networking sites. 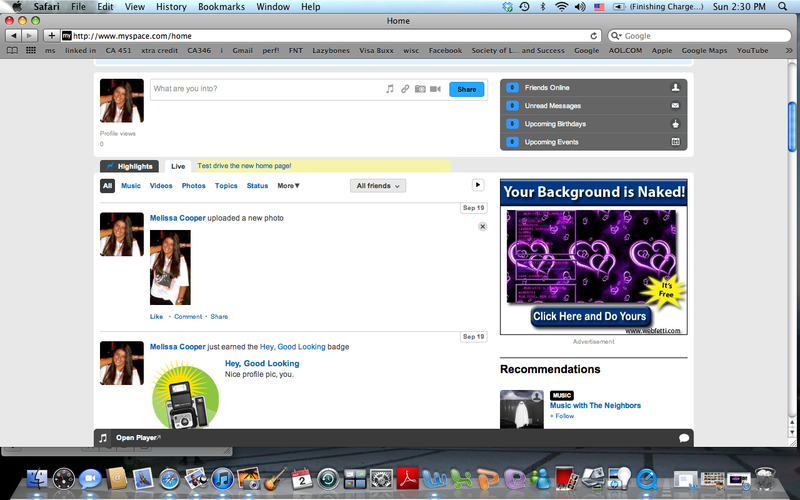 Since Facebook and Twitter are already so popular I have decided to join LinkedIn, Google+, and MySpace. I have known about LinkedIn for a while now, however I was always too lazy to set up an account. 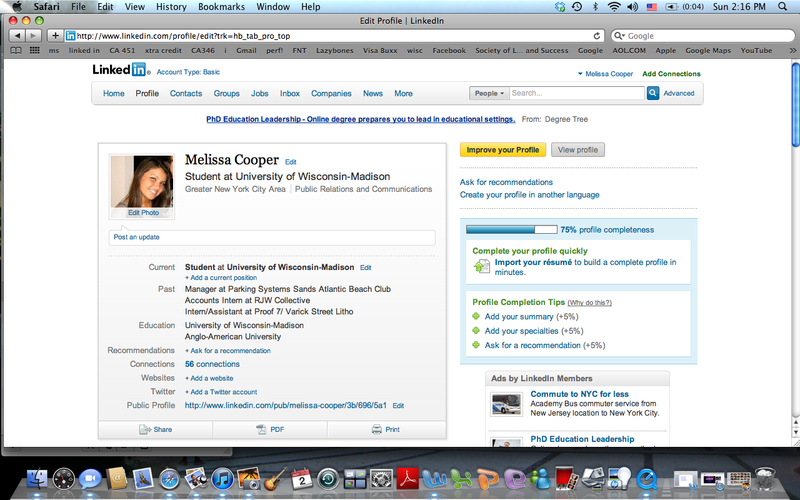 I am so glad that Social Networking is my practicum project topic because I am now obsessed with LinkedIn. I cannot get off of this site and I immediately have made 21 connections and have discovered that many of my close friends use it. Especially as a graduating senior looking to find a job in the next upcoming months, LinkedIn could not be more useful for making connections for available job opportunities. It is pretty much an online resume but better! I am still getting used to it and you can only send invitations to link with people who you know well, and you need to send invitations using the person’s email address. Google + is always a social network that I have been wanting to join since everyone was raving about it when it first came out this summer, especially because it is so exclusive and you can only join after being invited by someone who is already a member. I had one of my friends who is already a member send me a request to join, signing up was easy however I am confused by the set up of the site. 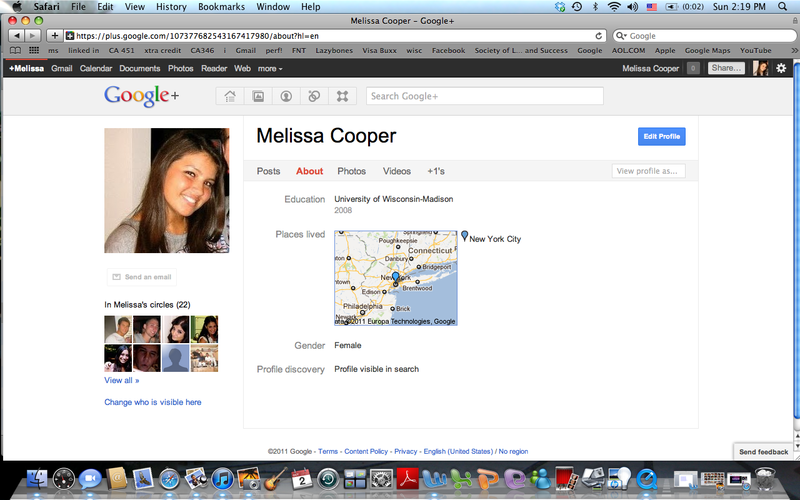 Google + has a lot in common with Facebook except I believe that it is a little more confusing. Adding friends seems simple, when you find people you know and add them to your “friends circle” they automatically get placed there however they still have to accept you to their profile before you can see each other’s posts. The only upside to Google+ so far that I have noticed is that there are much more privacy settings, and you are able to organize everyone who you are connected to in different categories such as “friends” or family” and then you are able to share certain content with separate groups (unlike the privacy settings on Facebook). So far I have not made any media or status posts yet, however I have posted a profile picture, and I have added 22 people into my friends circle from which 15 have added me back into theirs. I used to have a Myspace when I was younger but once Facebook came out I completely stopped using it and forgot all about my old account. Anyway, I just rejoined with a brand new account and so far all I have done is filled out my basic information and uploaded a profile photo of myself. Myspace is the least interesting out of the three social networking sites that I have joined and is so far the hardest to use only because it is so old that not that many people use. 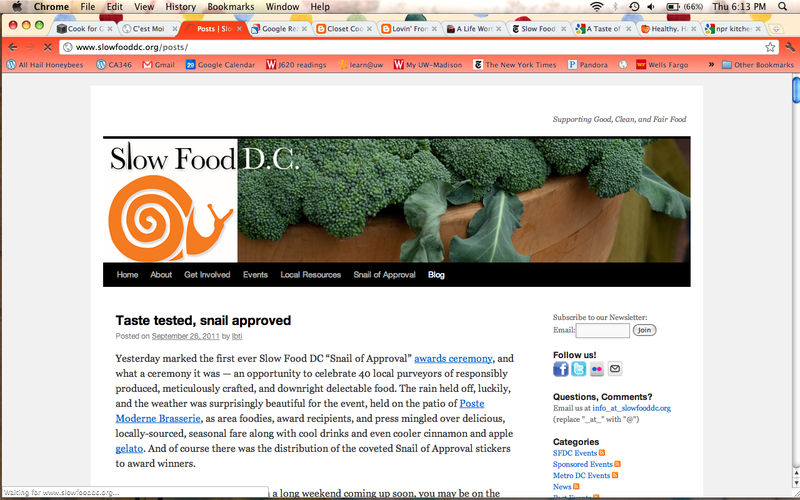 There are also way too many advertisements, which I find unappealing. As of now it has been really hard to find and add friends on it but hopefully this will change soon.. Furthermore LinkedIn is definitely my favorite out of the three and I really enjoy it. Google+ may not be my favorite so far but it is definitely the most interesting because it is so advanced, new and exciting. Lastly Myspace has definitely improved over the years to match up to its competitors and hopefully I will discover new things as I keep spending time on it but as of now it is my least favorite out of the three. As I make more progress I will post links to my profiles.